One of Peru’s top tourist attractions (after Machu Picchu) is the floating reed islands of Uros. We were less than excited about traveling to Uros, but of course we felt that we couldn’t come to Lake Titikaka without visiting this famous sight… The Islands have become very commercial, now relying entirely on tourism for thier existence and livelyhood. Still, thanks to the trusty Polaroid, this short visit was due to be one of the most memorable interactions with local people so far! One of the woman caught sight of my camera and asked about it- Of course, being a good photographer (and a mediocre Spanish speaker), I opted for a demonstation. It caused such a stir that soon all the islanders had gathered around each one yelling ‘Amigo, a mi, por favor!’ One after the other, I shot off the last of the pack of film, which regrettably I didn’t even get copies of before our boat was ready to leave… But the islanders were all so pleased with the unexpected souvenirs brought by the gringos, I’m happy to settle for memories! OK, this is big news everyone… I know you are all dying to see Machu Picchu pictures, but this is way more important. We have all been waiting a long time for this day! Lena has finally cut her dreads… Of course we’ve captured the whole two-hour long ordeal in glorious stop motion. It was a pretty rough and tedious job for me, and I think pretty painful for Lena. I tried to be as careful as possible, but honestly, I wanted to be finished as fast as possible! In the end though I was pretty proud of my handsome work- Hopefully Lena is too. Unfortunately, we didn’t have time afterwards to have a fashion photo-shoot, so you will have to wait to see some more detailed photos of the amazing work. Trust me though, it’s very chic. 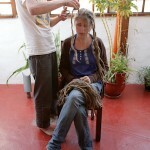 We have been in Cusco for over four weeks now, and what do we have to show? Not so much really (except some handy Spanish conjugations), but we do have a few more photos to share. This place has strangely come to feel a like home, and it will be sad to leave. Lena and I will be heading into the mountains tomorrow, towards Machu Picchu… Hopefully we will be back in another week or two with some more stories to share. Cutting the first dreads... maybe halfway there.